So I’ve decided that rather than futzing around with a map (and my spellchecker liked “futzing.” Who knew?) I’d just copy the list from the city website. And messing with the list makes me think that maybe futzing with a map would be easier. Dear God. Ultimately, once I remove all of the formatting and the extraneous stuff like addresses and photos, I’ll maybe bold the ones I’ve been to and change the colors of the ones I’ve written up? Or maybe pretend I’m using a highlighter and turn the ones I’ve been to blue and the ones I’ve written up green or purple? Or maybe use pink and orange, so that it looks less like links. I think I like that. once I’ve written it up? Should I pick a different shade of orange? Yeah. I like that darker orange better. Now, once I’ve cleaned up the list what should I do with it? For reasons I don’t understand, school playgrounds are on the list now — this makes me a bit nervous since, well, school property. I think I’ll remove them from the list as I go. Should I put them on my “about” page? Add a new “about”-type page for this list? Make it a blog post with a special tag? I think that probably the new “about”-type page would be best so that *I* can find the list pretty easily. I don’t want to lose it and then have to recreate it again. Now if you’ll excuse me, I have to go remove photos from the “L”s. P.S. It just hit me. Once I’ve finished this list and all of them are orange, I’ll have to go back through the official city list because I’m pretty sure that they’ll’ve added new parks in the however-long it takes me to go through the whole list. This is what’s known as job security. Or would be, if I were making any money from this yet. I finally made it to exactly one Fiesta event this year, the Fiesta de los Reyes at Market Square. The “Reyes” of the title is, specifically, the Rey Feo (literally “ugly king,” but some of our Reyes Feos have been quite attractive in my opinion). From what I can gather, the man who becomes Rey Feo is the one who raises the most money towards a scholarship program. 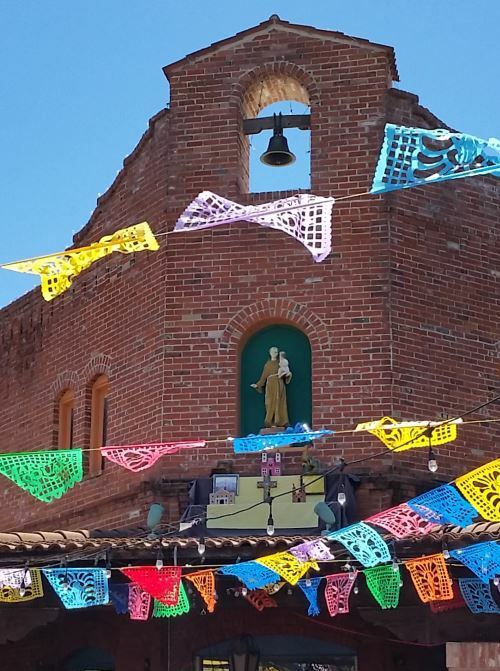 The Fiesta de los Reyes came across as a pretty standard street festival. Fortunately, I love street festivals. There were several stages set up (one under Interstate 35, one on San Saba Street, and at least two down Produce Row). Map of San Antonio from 1909 (and thus in the public domain) showing where Interstate 35, San Saba Street, and Produce Row are (also Houston and Santa Rosa Streets and Milam Park, for reference). Interstate 35, of course, wasn’t there yet in 1909, because the Interstate System wasn’t even authorized by Congress until 1956. The US Numbered Highway system (things like US Route 1, US Route 6, US Route 30, etc.) wasn’t even in place yet in 1909. I’m pretty sure that this is St. Anthony. I’ve been to Market Square a couple of times in the past, but never noticed that little alcove up there before. The bands that were playing when we were there in the early afternoon were a Mexican group called Dynastia Moreno (unfortunately, I’m not that familiar with Mexican musical styles to be able to identify their style of music. They sounded good, though), a Christian gospel/blues band called, well, Rev. Blues (they’re Texans, but blues bands always make me homesick for Chicago), a cover band of what looked like teenagers that was playing “Enter Sandman” as we walked past, and some other band at the Santa Rosa and Produce Row end of Market Square on a stage on the steps of the old Museo Alameda, which is now the Centro de Artes of Texas A&M – San Antonio. Unfortunately, it was too crowded for me to be able to read the signs giving the names of those groups. I figured I’d be able to look them up later, and I’m having no luck at all with that yet. The Museo Alameda was an experiment on the part of the people at the Smithsonian. The Museo Alameda was a museum for Latin American art that was a full affiliate of the Smithsonian. It didn’t really catch on, unfortunately, and only five years after it opened, the Museo Alameda closed its doors. San Antonio still has a Smithsonian affiliate, though. Since 2014, the Witte Museum has been a Smithsonian affiliate. That reminds me, the new upgrades to the Witte are done and Alex and I visited it and took even more pictures. I have to post that soon. See what I mean about the crowds? And, as I said before, Market Square was packed with people. It was a lovely day in the mid- to high 70s, so Alex and I had more energy than we do during the summer months, but it was even a little crowded for me, and I generally love the hustle and bustle of public festivals. So we walked once around and got a little of the fiesta spirit, took some pictures, and then went home. The “walk once around,” by the way? Took an hour and a half. Fiesta is the biggest party of the year in San Antonio and I’m afraid that I haven’t fiesta-ed nearly as much as I should have as a travel blogger. I guess we probably should go back to the beginning. Well maybe not all the way to the beginning, because that’s when groups like the Apache, the Comanche, the Caddo, and the Coahuiltecans were the only humans in this area of North America, and that’s beyond the scope of this post (I may share some of that part of the history of the area when I write about the various mission). In the 17th Century, the government of Spain decided to expand New Spain, which was located in what are now Florida and Mexico, into the mainland of what is now the United States. In 1810, Mexico (which included most of the southwest of the United States, which included parts of Colorado and Wyoming) began an 11-year process of gaining independence from Spain. Well, once Mexico had its independence, Texas apparently decided that this was a pretty good idea, and so they fought a roughly six-month war against Mexico from October of 1835 until April of 1836 (you see that April there? we’ll be coming back to it in a minute). The first major battle was fought in San Antonio on October 28, 1835. This was the Battle of Concepcion, so called because it was fought on the grounds of Mission Concepcion. The Mexican soldiers took comparatively heavy losses and retreated, making this a win for the Texians (yes, that “i” is intentional — it was the demonym for Texas back then). Things wouldn’t go so smoothly on March 6, 1836. This was the date of the Battle of the Alamo, in which somewhere in the neighborhood of 200 Texians were killed and Mexico was declared the winner. Most of the bodies of the slain Texians were cremated on pyres near the site of the battle. The exact sites have been lost to history, but I have heard that the place where the San Antonio Fire Museum is currently located may have been one, and others may have been along Commerce Street. Then, on April 21, 1836, the two armies faced off for the final battle of the war near present-day LaPorte. Ultimately, the battle, known as Battle of San Jacinto for reasons that I can’t quite get confirmation of, took 18 minutes. The Mexicans retreated and the Texians reportedly chased them down, killing as many Mexicans as they could. Nobody ever said that the Texians were good winners. In the late 19th Century, the city of San Antonio decided to mark the anniversary of the Battle of San Jacinto with, well, a party. Originally called Fiesta San Jacinto, the centerpiece of Fiesta was the Battle of the Flowers, which was sort of like the Tournament of Roses Parade, if people would rip the flowers off of the floats and throw them at each other. Look, I’ve lived in Texas for 24 years, as of next month, and sometimes I suspect that I’m no closer to being able to explain Texans now than I was back in 1993. The name was changed to Fiesta San Antonio in 1960 and Fiesta is now ten days long, beginning the Friday before April 21 and ending not that next Sunday, but the Sunday after that, so an entire week and two weekends. The day of Battle of the Flowers Parade is a day off for many, including all teachers, staff, and students of the schools of San Antonio. 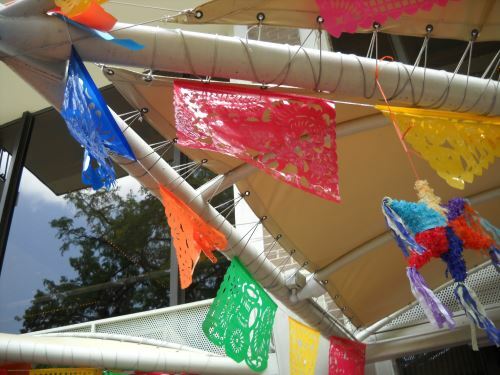 In my 24 years here, I’ve never gone whole-hog for Fiesta. I’ve been to Fiesta events at the Botanical Gardens and I think maybe the zoo once. My mother and I went to Fiesta San Fernando, which is music, dancing, and food in Main Plaza one year, I even attended the Battle of the Flowers Parade in 2014 (it was a parade; except for the Fiesta princesses on some of the floats, it didn’t look much different from the Fourth of July parade in my Chicago suburb home town), but not much else. I began writing this post on April 28, which was Battle of the Flowers Day, but it took several hours to compose and so now it’s Saturday. Later today, if I can get the energy up to do so, I hope to rectify some of my Fiesta non-participation. 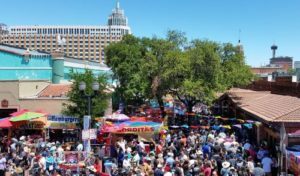 I hope to make it to Market Square for their Fiesta event and if I can hack the hour walk there and back, I might check out the King William Fair, as well. But, before I can even consider doing any Fiesta-ing, I’d better get some sleep. Sorry about the delay in posting. I’ve been opening that post on Stone Mountain and staring at it on a fairly regular basis, but I’m still not quite sure what to say. I think I’ll probably end up winging it. In other news, my mouth finally doesn’t hurt (I had a little discomfort on the other side the other night and was all, “Oh, no. Not again!” but I have felt fine since then). I’m still waiting to see what, if anything, my insurance will pay for. It looks like the Witte Museum is finally done. Alex and I went there today and I took lots of pictures. Expect an updated post on that soon-ish. And I’ve passed the $100 mark on paying myself to study my foreign languages. I’ve actually passed the $125 mark and am heading for $130. It’s not enough to consider myself rich, yet, but I’ll get there. Eventually. Maybe. Well, back to staring at that post some more . . . .
I’ve found an organization called Falling Fruit, which is attempting to make a comprehensive map of places where foragers can find food. One of the things they are collecting is information on public (or publicly accessible) trees and other plants that are edible. San Antonio has a lot of plants that can be used for food, but its representation on the website is really kind of pitiful, with only 160-some things marked on the map. Austin is a lot smaller but has nearly twice as many locations marked. Falling Fruit is also a licensed charity, so if you are in the United States and want to make a charitable donation, donations to Falling Fruit are tax deductible. There are prickly pear cactus absolutely all over the place here, and not only can the fruit be eaten, but the pads themselves are edible as well. I certainly wouldn’t want to see the all of the prickly pear cactus being eaten by foragers, but it’s nice to know that it’s there, all the same. And I’m not even listing the thousands of live oak trees that litter the area, even though acorns have been used as food for millennia. This does mean that I’m going to start revisiting some of the parks that I’ve already visited, to see what I can find there. Today we went back to Phil Hardberger Park and found more prickly pear and a mesquite tree (mesquite pods are edible). There’s supposedly Texas persimmon in the park somewhere, but I haven’t found any yet. I passed John Tobin Park, which is just an activity center on a small lot on the corner of Martin and Brazos Streets, on the day of the Women’s March. I took a couple of pictures as I walked past and told Alex that this meant that I could cross this park off my list. I may be returning to it, more or less, after all, as it turns out. Tobin Park backs up to Alazán Creek and there is now a greenway along the stretch of the creek north of this section. Will the greenway ever reach this part of the creek? There are no plans now, but who knows what will happen with the greenway project in the future? I live fairly close to Walker Ranch Historic Landmark Park. And before Alex was born, that area was even closer to where we lived. As a result, for most of Alex’s life, “the park” has meant Walker Ranch. While I’m still not entirely certain what the “landmark” is (though perhaps the entire park is the landmark, since it si on the National Register of Historic Places? ), I definitely can tell you at least some of what the word “historic” is for. As the park is near the confluence of the Salado and Panther Springs Creeks, humans have lived there for literally millennia. When the Coahuiltecans were the main human inhabitants, they camped there, and once the Spaniards arrived, they began the occupation of that space on a full-time basis. When Spain colonized the areas which are now Florida, Texas, and Mexico, the law of Spain was that all Spaniards were required to be Roman Catholics. So, in order to count the local indigenous peoples as Spaniards, they needed to be converted. To that end, Franciscan monks moved to what is now San Antonio in the 18th century to convert the local Coahuiltecan Native Americans and they founded five missions. Mission San Antonio de Valero (which is now The Alamo) was the first one founded. 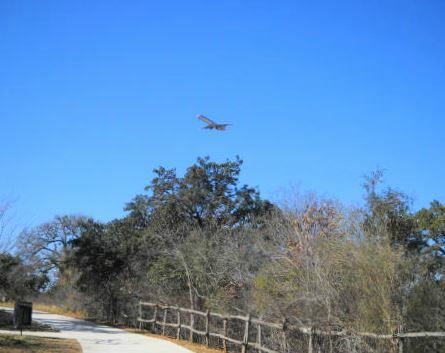 An airplane flies near the main loop trail at Walker Ranch Park, 2014. Hundreds of people lived at the missions, and that required food. At first, the natives and Franciscans would raise cattle near the missions, but as the local civilians began to ranch themselves, the groups would come into conflict. The various missions, as a result, founded ranches that were farther out. 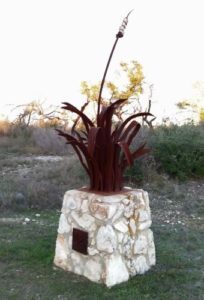 You can still visit one of these missions, Rancho de las Cabras in Floresville, the ranch for Mission San Francisco de la Espada. The other ranches are now in what is San Antonio proper and, as a result, most of their structures the “context” is gone. The ranch for Mission San Antonio de Valero (which they shared with Mission de Nuestra Senora de la Purisima Concepcion de Acuna and Mission San Juan Capistran0) was the Monte Galvan. I’m trying to find the exact boundaries, but what is clear is that Walker Ranch Park is within the area that was included in the ranch. 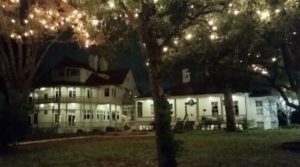 The “Walker Ranch” name comes from the Walker family, which ranched there in the early 20th century. The Walker Ranch is on the National Register of Historic Places (it was added in 1975). Today, Walker Ranch Park has a playground, portable restroom facilities, a picnic pavilion and several walking/biking paths. The main path is a paved loop path that goes around a field with a windmill (I don’t know if the windmill was put there by the Walker family or not). In spring, in years when the rain is pretty good, the loop trail is a fantastic place to see wildflowers, bluebonnets in particular. 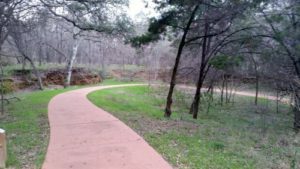 There is also another, unpaved, path that follows Panther Springs Creek, and Walker Ranch Park is also on the Salado Creek Greenway. The Greenway connects Walker Ranch Park to Phil Hardberger Park to the northwest and to McAllister Park to the southeast. Walker Ranch Park is also a great place to go deer- and planespotting. There is a community of deer that live in the park and they are habituated enough to people that you can see them, but not so used to people that you can actually get anywhere near enough to hurt them. The planes are definitely not close enough that people can hurt them, as they’re overhead. The park is in the landing pattern for the airport, and so planes come overhead pretty frequently. And sometimes, when conditions are just right, and you are far enough in the trees, you can hear the whooshing sound of the wake turbulence. For some reason, we’ve only ever heard it when surrounded by trees and not when near the parking lot. I don’t think that the wake turbulence is blocked out by the noise from the cars, because I don’t even hear it when there are no cars. Despite it being out of the way, I’ve been to Stone Oak Park twice. The first time was July of 2015 and it was just amazingly hot. It seemed like a nice park, though, so Alex and I returned in November of 2015 so that we could finish the rest of the main walking path. It turns out that we saw most of the exciting stuff on that first trip. Stone Oak Park has the usual things, bicycle trails, a playground, a picnic pavilion, portable restroom facilities, and so forth. The park also has a 2.7-mile walking trail marked by public artworks. I am trying to find the names of the artworks, but haven’t had much luck so far. Perhaps this will be my excuse to return. Stone Oak Park is also home to two caves, known as Bear Cave and Cub Cave. Bear Cave got its name from the bones of a black bear that were found inside. Cub Cave got its name because whoever named the caves wanted to stick with the “bear” theme and Cub Cave is smaller than Bear Cave. Bear Cave is blocked off to keep people from climbing or falling in. As of my last visit, Cub Cave was still open. Stone Oak Park was founded for one very practical reason — it is in a vulnerable area of the state known as the Edwards Aquifer Recharge Zone. In particular, the caves along the recharge zone are important for cleaning the water as it enters the aquifer. The aquifer is where San Antonio and its surrounding area gets its drinking water. The water drains into the aquifer in a region from just outside Loop 1604, stretching up past the western boundaries of New Braunfels and San Marcos, and way off to the west to around Brackettville (which is between Uvalde and the border with Mexico). In the process of preserving this land, the city has preserved two of the most important caves for keeping our water clean. Hopefully next year, we’ll have more energy and can take some Christmas pictures before the night of Christmas itself. The last time I looked at the official list of parks, I thought that O.P. Schnabel Park was listed under “O” and that I’d skipped it, but apparently it’s under “S” and so it’s up next. Schnabel Park was founded in 1964 with the name “Bandera Road Park,” which is certainly descriptive, but not very exciting. In 1977, they renamed the park in honor of O.P. Schnabel, founder of the Beautify San Antonio Association. Do you know how hard I had to dig to find even that little bit on Schnabel? Honestly. I searched Google for his name and the first three pages or so were all articles on the park. I tried putting a “-park” in there and, apparently due to a bug, still listed the park. So frustrating. I even tried Find a Grave to no avail. Apparently, wherever his grave is hasn’t been indexed yet. Finally, I got the “-park” to work and you know what I found? Lots of listings on the OP Schnabel apartments. Picture me resting my elbows on my keyboard tray and putting my face in my hands here. So, then I tried again with “-park -apartment” and finally got, like two things on the man, both of which were writeups for the Beautify San Antonio Association archives. I’ll take what I can get at this point. As you might expect from the prevalence of the park in the Google results, Schnabel Park is one of the best parks in the city. The park has two picnic pavilions, a kitchen, sports fields (baseball, basketball, soccer), at least two playgrounds, restrooms, a swimming pool and at least 4.5 miles of hiking trails. Schnabel Park also has a trail head for the Leon Creek Greenway and is home to the Braundera YMCA. I also know some people who go rock-climbing there as well, though I’m not sure if that’s an officially sanctioned activity. Alex and I have seen a decent amount of wildlife in the park on our visits, including a buck who walked across the path right in front of us (see image). We have also seen several military aircraft fly overhead including, on one memorable occasion, a C-5 Galaxy. We also have attempted to access the Leon Creek Greenway from the park a few times, and the trailhead is quite a ways from the actual greenway, so we usually give up before getting to the greenway. Phil Hardberger Park is one of the crown jewels, if not the crown jewel, of the San Antonio Parks and Recreation system. The city purchased the family farm of the Voelcker family and have turned the site into a natural and historic landmark. Hardberger Park is 311 acres and has 19th century buildings on the site. Hardberger Park is unusual in that it is actually two separate parks, to all appearances. The eastern part of the park has an entrance on Blanco Road and seems (to me at least) to be the more heavily visited of the parks. The eastern side has, in addition to the usual walking paths and playground, the picnic pavilion and the larger of the two dog parks. The western half of the park has an entrance on Northwest Military Highway and has, in addition to the usual walking paths and playground, the Phil Hardberger Urban Ecology Center. 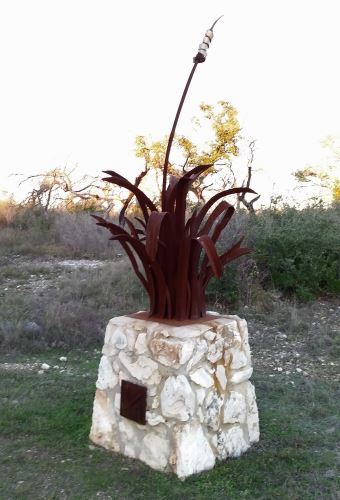 The west side also has an art installation, “Golden Age” by Anne Wallace, which uses reflective metal to simulate the appearance of a wildfire on the prairie area behind the Urban Ecology Center. Personally, I think that Wallace miscalculated the height of the grasses in the prairie, her explanation of the work reads, in part, “As Hardberger Park’s restored grassland matures, the gold will appear to hover just above the prairie, using the sun and wind to bounce light off the tops of the grasses,” except that by now, the gold is buried within the grasses for most of the year. I wonder if it’s too late to raise the poles holding the circles up another three to six inches . . .
Alex and I have explored the eastern side of the park pretty thoroughly. If you are in San Antonio and are starved for some greenery, there is a lovely corner of the Geology Trail that is really vibrant in the springtime. We have spent more time but done less exploring on the western part of the park, because there are a lot more paths over there. Somehow, since Hardberger is one of the closest parks to my home, we only go there when we’re out of ideas on where to go, and since between the heat and the fact that there just aren’t many people out there, we tend to do just a short walk and then hop across the street to pick up groceries (as I write this, the western entrance is across the street from the Alon Market HEB supermarket; I make no promises that the supermarket will be there whenever you’re reading this). I mentioned earlier that there are two halves of the park with separate entrances on different streets. 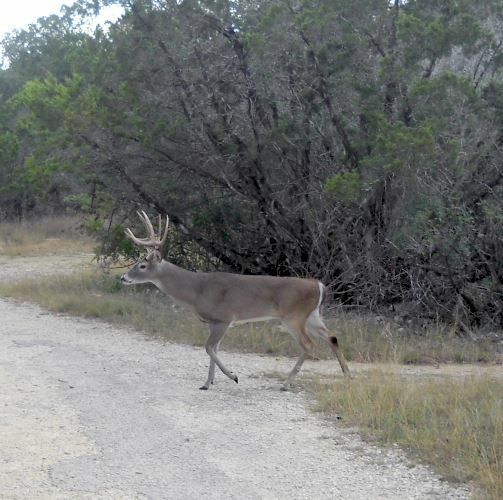 The halves of the park are separated by Wurzbach Parkway, a four-lane highway with a 50 mile per hour speed limit. So it’s cross-able, but it can be something of an adventure getting from one side to the other. The plan is to add a bridge joining the two halves. And the bridges that are on the Howard W. Peak Greenway System are very nice, and would serve for the purpose of getting visitors safely across. That’s not the plan, however. The plan is for a $25 million bridge that would be 150 feet wide and have enough native greenery on it that animals wanting to cross from one side to the other will be encouraged to use it rather than risk crossing the road as well. At the moment, it looks like voters will be voting on a bond to raise $15 million of this money in May 2017. Will the bond pass? After the November 2016 elections, who knows? Will the Hardberger Park Conservancy be able to come up with their share of $10 million? I don’t know that either. If I ever do find out, I’ll let you know. Update: 3:10 p.m. Actually you can no longer cross Wurzbach Parkway. They’ve put up a Jersey barrier. Unfortunately, this is not a barrier made of jersey material (which would be easy to move aside and get through) but is, in fact, a 3.5-foot-high cement wall. As a result, the only way from one side to the other is to drive until when (if?) they build that bridge.